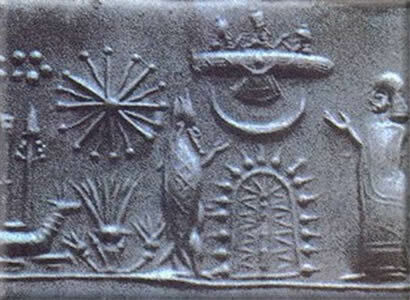 Working from the same archaeological discoveries, artifacts, and recovered records as archaeologists and linguists have for two hundred years, Sitchin propounds – proves, in the opinion of this author -- that the Anunnaki (Sumerian: “those who came down from the heavens”; Old testament Hebrew, Anakeim, Nefilim, Elohim; Egyptian: Neter), an advanced civilization from the tenth planet in our solar system, splashed down in the Persian gulf area around 432,000 years ago, colonized the planet, with the purpose of obtaining large quantities of gold. Some 250,000 years ago, the recovered documents tell us, their lower echelon miners rebelled against the conditions in the mines and the Anunnaki directorate decided to create a creature to take their place. Enki, their chief scientist and Ninhursag their chief medical officer, after getting no satisfactory results splicing animal and Homo Erectus genes, merged their Anunnaki genes with that of Homo Erectus and produced us, Homo Sapiens, a genetically bicameral species, for their purposes as slaves. Because we were a hybrid, we could not procreate. The demand for us as workers became greater and we were genetically manipulated to reproduce. “...no concrete problem is going to be solved as long as the experts of astronomy are too supercilious to touch "mythical" ideas -- which are firmly believed to be plain nonsense, of course -- as long as historians of religion swear to it that stars and planets were smuggled into originally "healthy" fertility cults and naive fairy tales only "very late" -- whence these unhealthy subjects should be neglected by principle -- and as long as the philologists imagine that familiarity with grammar replaces that scientific knowledge which they lack, and dislike.” - Giorgio de Santillana, Ph.D.& Hertha von Dechend, Ph.D., "Hamlet's Mill"
Tombaugh discovered Pluto in 1930. Christie, of the U.S. Naval Observatory, discovered Charon, Pluto’s moon, in 1978. The characteristics of Pluto derivable from the nature of Charon demonstrated that there must still be a large planet undiscovered because Pluto could not be the cause of the residuals, the “wobbles” in the orbital paths of Uranus and Neptune clearly identifiable. The IRAS (Infrared Astronomical Satellite), during ’83 -’84, produced observations of a tenth planet so robust that one of the astronomers on the project said that “all that remains is to name it” -- from which point the information has become curiously guarded. In 1992 Harrington and Van Flandern of the Naval Observatory, working with all the information they had at hand, published their findings and opinion that there is, indeed, a tenth planet, even calling it an “intruder” planet. The search was narrowed to the southern skies, below the ecliptic. Harrington invited Sitchin, having read his book and translations of the Enuma Elish, to a meeting at his office and they correlated the current findings with the ancient records. 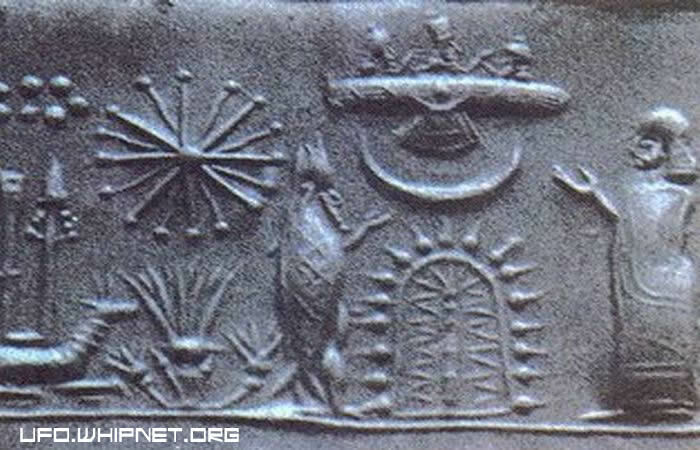 The recovered Enuma Elish document, a history of the formation of our solar system and more, says that, at the time when Mercury, Venus, Mars, Jupiter, Uranus and Saturn were in place, there was a Uranus sized planet, called Tiamat, in orbit between Mars and Jupiter. Earth was not in place yet. A large wandering planet, called Nibiru, was captured into the system gravitationally. As it passed by the outer planets it caused the anomalies of their moons, the tilting of Uranus on its side, the dislodging of Pluto from its being a moon of Saturn to its own planetary orbit. Its path bent by the gravitational pull of the large planets, first its satellites collided with the large planet Tiamat and, on a second orbit through, Nibiru collided with Tiamat, driving the larger part of it into what is now Earth’s orbit to recongeal as Earth, dragging its moon with it to become our Moon with all its anomalies. The shattered debris of Tiamat’s smaller part became the asteroid belt, comets, and meteorites. The gouge of our Pacific basin is awesome testimony to the collisional event. Nibiru settled into a 3600 year elliptical retrograde (opposite direction to all the other planets) orbit around our sun, coming in through the asteroid belt region between Mars and Jupiter at perigee and swinging far out past Pluto at apogee. Harrington acknowledged that his information agreed with all these details and the maps they each had drawn of the orbits were almost indistinguishable. The current probable location of Nibiru (Planet X, our tenth) estimated by both was the same. We need to force the issue of the tenth planet being in our solar system, not just to demonstrate the validity of the new paradigm but for a very practical reason. The ancient records are very clear. The passage of the tenth planet, Nibiru, once every 3600 years, through the inner solar system effects the Earth, sometimes in catastrophic ways. It is very probably the cause of pole shifts, pole reversals, changes in the precessional movement, perhaps even catastrophic bombardment by asteroid size space debris that it may drag along with it. Since it passes through the asteroid belt area between Mars and Jupiter and its orbital path may vary depending on the position of the other planets when it comes though, it may have been responsible for the devastation of Mars. A rigorous, detailed computer modeling of the solar system, including the tenth planet needs to be done urgently for our own planetary safety. Remember that the Vatican maintains an astronomical observatory and Msgr. Balducci may have access to information that prompts him to make the amazing statements he has ---- no doubt as voice of the Vatican.